Trevti Dal Recipe or Gujarati Dal recipe with step by step pics. Trevti dal is a dal recipe made of a combination of three delicious and healthy dal like Toor dal, Moong Dal, and Chana Dal. This is very simple Dal Recipe, that takes very less time. Searching for yellow dal recipe or Toor dal recipe or Moong dal recipe? Here it is!!! Most of the time our dinner is roti and dal. If I make this combo, no one says no for dinner. 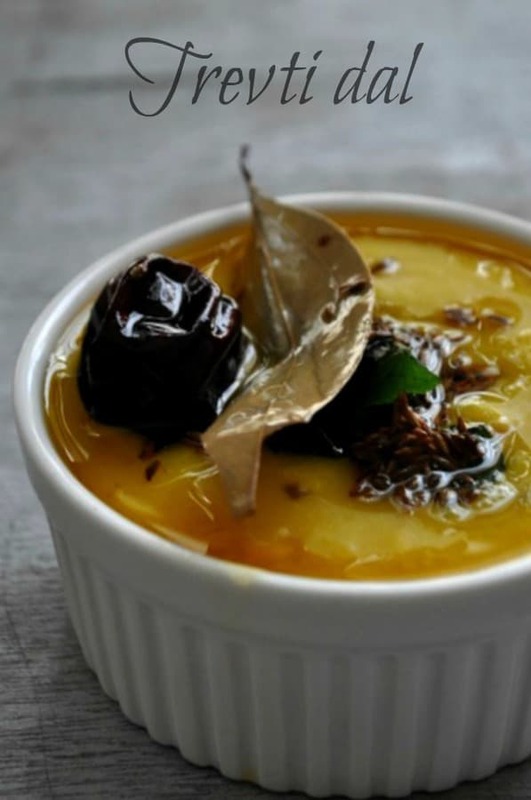 This dal goes well with jeera pulao and steamed rice as well. It tastes like Dal tadka. If you are looking for North Indian Side dish recipe that we can make below 30 mins check this link. Dal Makhani recipe that I have posted recently with video. After that, i wanted to post dal recipes as I don’t have simple dal recipes in Prema’s Culinary. Many of my readers are working ladies and they always want a quick and easy side dish for the dinner. Trevti Dal is a very good option and healthy to make for dinner. If you making dal for toddlers, then add more ghee. Dal with ghee always good for kids. Dal rich in protein so taking dal every day is very good for health. It doesn’t mind if you take how much dal a day but don’t skip taking dal. Any variety of dal you can take. If you are looking for more Gujarati Recipe do Check, Methi Thepla, Khandvi, Moongdal Dhokla. Take moong dal, Toor dal, chana dal 1:1:1 ratio. Pressure cook it with enough amount of water. Add 1/3 tsp of turmeric powder and a tsp of oil, close and pressure cook, till it becomes soft and mushy. Heat Ghee or oil in a pan. Add cumin seeds,let it splutter and then add the bay leaves, dry red chilly, hing and curry leaves. Fry it. Finally, add this tempering with dal. Add salt and mix well. Trevti Dal, Gujarati Dal, Three Dal is ready to serve. 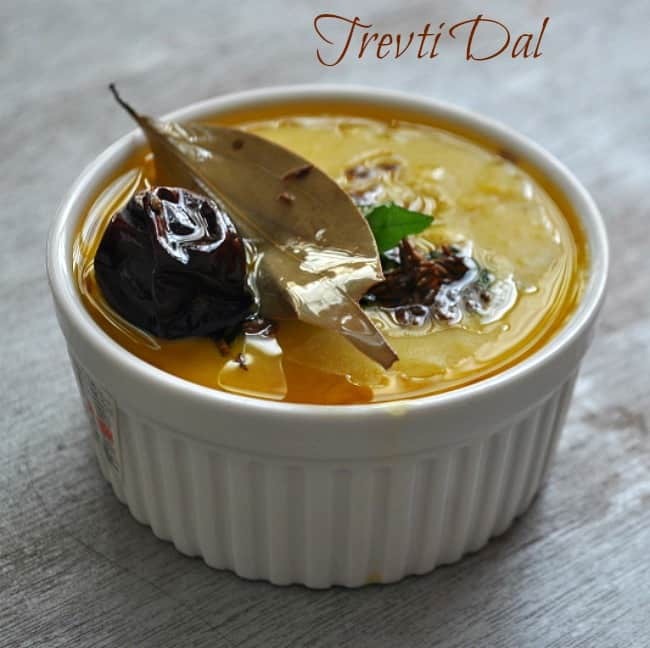 Trevti dal is ready to serve and you can serve it with steamed rice or chapati. Hope you like this recipe, do share you this with you friends and Enjoy!!! Trevti Dal recipe is the combination of moong dal, Toor dal, and chana dal. This very healthy and simple dal recipe with a lot of protein. Take moong dal, Toor dal, chana dal 1:1:1 ratio. Pressure cook it with enough amount of water. Add ⅓ tsp of turmeric powder and a tsp of oil, close and pressure cook, till it becomes soft and mushy. Add cumin seeds,let it splutter and then add the bay leaves, dry red chilly, hing and curry leaves. Fry it. Finally, add this tempering with dal. Add salt and mix well. Trevti Dal, Gujarati Dal, Three Dal is ready to serve. Add enough water for cooking dal otherwise, it might burn at the bottom.The ratio of dal you can adjust according to your wish. I have added an equal quantity of each.Tempering/tadka is very important if you burn the tempering the dal become better so make sure that you are doing it properly.